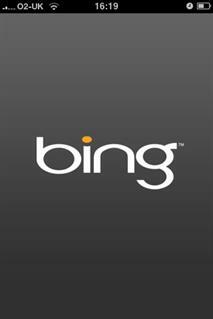 Bing, Microsoft's own search engine, has just announced a free iPhone App. 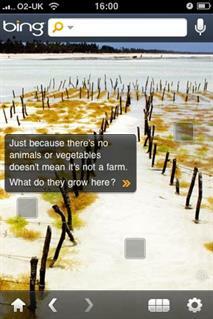 Estate Agents may want to trial this App before scepticism rears its ugly head. It does feel as odd as using internet explorer on an Apple Mac, but the features are good, damn good. The first thing you notice after launching the App is a large, clear and colourful picture smack in the centre (which changes daily). 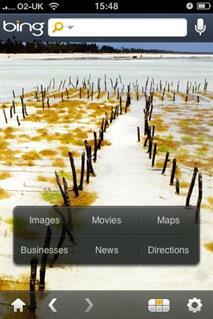 A press of the matrix icon in the bottom right brings up a full picture of a seaweed farm on the island of Zanzibar and it includes 4 tempting links that moves the user towards images of Zanzibar, Bing's own map of Zanzibar and a web search. This is a fantastic way of moving users (unwittingly) towards content that will be interesting to read. Back on the front of the App Estate Agents are given 6 different options; Images, Movies, Maps, Businesses, News and directions. Currently 'Movies' does not work but the Image option makes full use of the iPhone's ability to infinitely scroll through as many images as the user requires. Estate Agents, Have you tried the new Bing App? Contact us Resource Techniques via our Twitter profile or Facebook page.